Sukie was the last to leave Eastwick; the afterimage of her in her nappy suede skirt and orange hair, swinging her long legs and arms past the glinting shopfronts, lingered on Dock Street like the cool-colored ghost the eye retains after staring as something bright. This was years ago. The young harbormaster with whom she had her last affair has a paunch now, and three children; but he still remembers how she used to bite his shoulder and say she loved the taste the salt of the sea-mist condensed on his skin. I have been looking at my Lauri Stallings file. It is full of images that are some of the most striking I have ever taken. 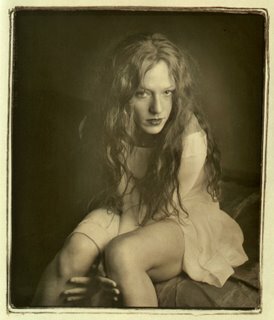 Some years ago when I was doing a fashion spread for the Georgia Straight with Ballet BC dancers in the Marble Arch I was amazed to see Lauri Stallings in a corner of an extra room Tony Ricci had given us so our subjects could change and relax between shooting sessions. There she was knitting and she smiled at me and in her Florida accent she said, "I knit, too." I thought, "Here is a witch with many talents." Those who glance at this blog with some regularity can expect a few more days of Lauri Stallings.